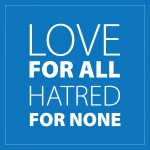 “No need to fear true Mosques” – Head of Ahmadiyya Muslim Community. The Ahmadiyya Muslim Community is pleased to announce that on 5 November 2016, His Holiness, Hazrat Mirza Masroor Ahmad, the World Head of the Ahmadiyya Muslim Community, the Fifth Khalifa (Caliph), inaugurated the Baitul Amman Mosque in Lloydminster, Saskatchewan in Canada. Upon arrival at the Mosque, His Holiness unveiled a plaque to commemorate the opening, which was followed by a silent prayer. Thereafter, His Holiness led the Maghreb and Isha prayers from the new Mosque. The following day, 6 November 2016, a special reception was held to mark the opening of the new Mosque in which Hazrat Mirza Masroor Ahmad delivered the keynote address. During his address, His Holiness spoke of the true purpose of mosques and how the new Mosque would not only be a place to worship God Almighty, but would also prove a means of serving and protecting all people. His Holiness said that at a time when there was widespread fear of Islam, it was a sign of open heartedness and “extraordinary courage” that the guests had attended an Islamic event. His Holiness then explained in detail the true objectives of building Mosques. Commenting on this verse, the Caliph said that it required Muslims to lovingly serve all of mankind, irrespective of colour, caste or creed. His Holiness said that Mosques of the Ahmadiyya Muslim Community reflected the Quranic spirit of benevolence and were built with the dual objectives of fulfilling the rights of God Almighty and also fulfilling the rights of mankind. His Holiness gave the example of the charitable initiatives in Africa where the Ahmadiyya Muslim Community was providing clean drinking water, healthcare and education by building water pumps, hospitals and schools in some of the most deprived parts of the world. Concluding his address, Hazrat Mirza Masroor Ahmad said that the local people who lived near the Mosque would soon come to see that the new Mosque would prove to be a “centre of peace for all of mankind”. Before the keynote address, a welcome address was given by the National President of the Ahmadiyya Muslim Community Canada, Lal Khan Malik followed by remarks by the Mayor-elect of Lloydminster, Mr. Gerard Albers who welcomed Hazrat Mirza Masroor Ahmad to the city. Thereafter, various other dignitaries also took to the stage. Both prior to and after the reception, His Holiness met personally with a number of guests and also held a press conference with local media representatives.